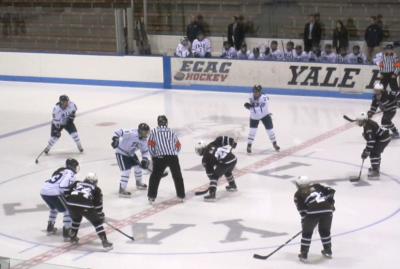 New Haven, CT- In a clash of ECAC and Ivy League foes Brown took on Yale on Wednesday Night. It was a game in which Yale spent a great deal of time in the Brown end pressuring and prodding, trying to get the puck past Katie Jamieson. Early in the first a Yale goal was waved off after protests from the Brown bench. The visitors meanwhile got on the board first when Janice Yang swept in on Jaimie Leonoff and got it past the Yale keeper at 11:36. At the time no assists were announced but they were later awarded to Katelyn Landry and Paige Pyett. The score remained 1-0 until less than a minute to play in the period when Brown’s Lauren Vella teed up a shot from near the blue line and it got past the keeper anyway. Brown entered the second period up 2-0. Landry and Jessica Hoyle were given assists on that goal as well. When period 2 opened up, Yale’s Heather Grant went into the penalty box for hitting from behind, and 30 seconds into the power play, Yang struck again with a power play goal assisted by Alena Polenska and Jennifer Nedow At this point Genny Ladiges came into the net for Yale. At 6:43 Paige Decker came in Jamieson’s left and sent a shot careening over, it ended up being deflected in by Ashley Dunbar, and an additional assist went to Jamie Gray. That would be the last of the Yale scoring, despite having a few power plays to work with. The third period found Yale on the attack as well, but with no success. Brown added an additional dagger when Laurie Jolin went in on Ladiges, and her teammate Emilie Dolan ended up with the puck on the other side of the net at 11:17. With the loss Yale drops to 1-15-0, and 1-8 in conference, Brown is 5-5-5, and 2-4-3 in the ECAC. Brown took 30 shots, Leonoff saved 8 of 11, Ladiges 18 of 19. Jamieson faced 26 Yale shots and saved 25 of them. Based on eyewitness account verified against official box score.